﻿ Confident Dental Care: Inman Aligners - Luton. As time goes by, your teeth can have a tendency to shift, sometimes causing your front top and bottom teeth to become crooked. At first glance, you may think you need fixed braces, however with the patented Inman Aligner, your front teeth can be gently guided to an ideal position quickly and effectively, in a matter of weeks. 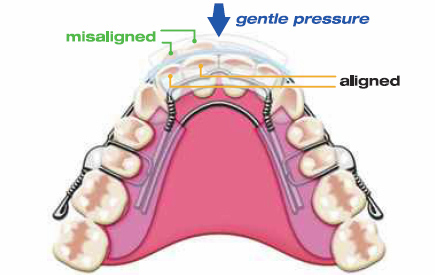 The Inman Aligner applies a gentle pressure to the teeth that need to be moved to an ideal position. This gentle proces is provided by the spring action of the appliance. No, The Inman Aligner is designed to treat the upper and lower front teeth. After an evaluation, your doctor can determine an Inman Aligner is correct method of for your particular case, and will recommend treatment options. Visit the Inman Aligner website to learn more.